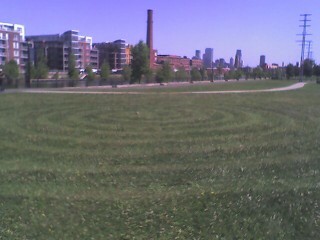 On Monday morning I made my third guerrilla labyrinth, this on a spiral in a very public place…along the Lachine Canal, just west of Atwater. It is just along side a this very popular bike path. A few people made nice comments as I made it. They are becoming quite easy and quick to do. At this point I don’t have anything to explain what they are or how to use it. I’m working on that though, various ideas are being worked on. I have my 4th one planned not too far from this one. Give me a few days.